Preheat the oven to 400°. Pat dry the fish. Mix mustard and oils together and spread on top and side of fish. Place parchment or wax paper on your surface and spread sesame seeds over it. Turn the fish over, so that it is dressed side down, onto the sesame seeds and pat it down so that the seeds adhere to the fish. Turn it over and place on a parchment lined baking sheet. Pat any excess seeds onto “bald” spots on the fish’s surface. 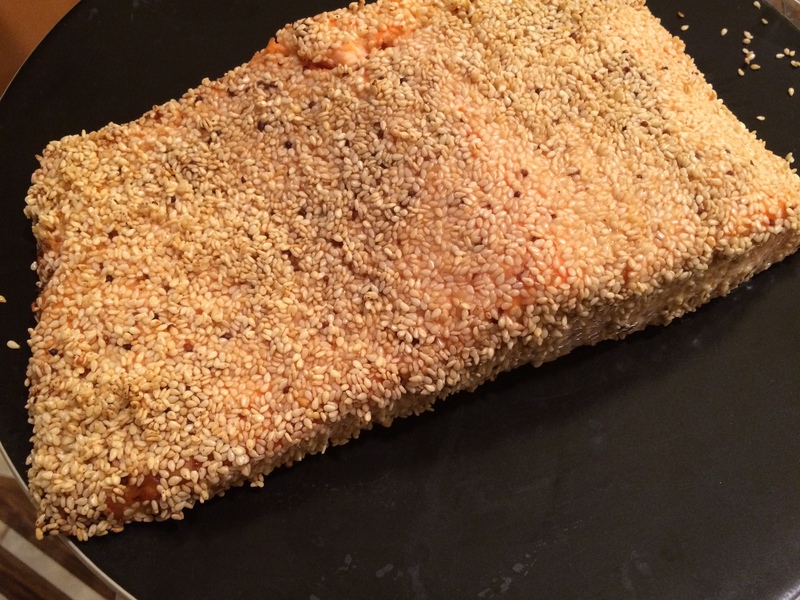 Bake on top shelf for 15-20 minutes depending on the fillet’s thickness and how done you like your fish. Serve with creme fraiche, chutney, or a sweet, spicy salsa. Or a mix of soy, sesame oil and sliced green onions. Note: You can vary this by omitting the mustard and mixing soy and sesame oil with some plum sauce.